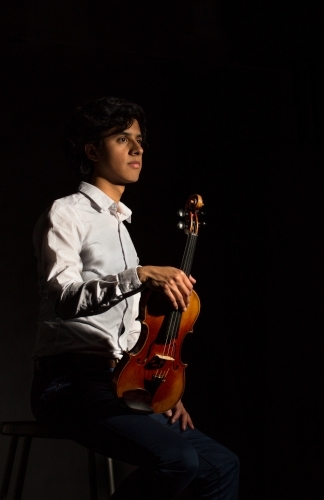 A native of Veracruz, Mexico, Carlos started violin lessons at a young age. He studied under Iliana Stefanova in Merida, and Nataliya Semanivska in Montemorelos, both in Mexico, before attending Andrews University, in Michigan, where he studied under Carla Trynchuk, completing a B.M. in Violin Performance. While in college, he took viola lessons with Claudio Gonzalez, and started to play viola in chamber groups and in the schoolâ€™s orchestra, where he found his fondness for the viola. During his junior year of college, he won the concerto competition at Andrews University, and played the first movement of the Khachaturian Violin Concerto. He has participated in masterclasses with Kurt Sassmannshaus, Olga Kaler, Lyndon Taylor, on the violin, and with Robert Chase and Basil Vendryes on the viola. As a chamber musician he has performed in masterclasses with the Kontras String Quartet and the Lafayette String Quartet. He attended Rocky Ridge Summer Festival on 2018, and studied with David Rose. He is currently attending Western Michigan University, where he is doing his Masters in Viola Performance, studying under Igor Fedotov. He plays with the Kalamazoo Symphony Orchestra as a WMU Artist Scholar position.